Nearly 3 million visitors from the USA visit Germany every year. In fact a growing number of people all over the world both budget-minded and otherwise have been choosing Germany as destination for travel. While there is no end to the attractions that the country offers to the tourists, there are a few sights that one must see especially when he or she is touring Germany for a short period of a week or less. The capital city of Berlin is the largest city of Germany and no visit to this country is complete without a visit to this historical city. This lively metropolis displays a rare blend of the past heritage with a vibrant and modern present. The city has a lot to offer by way of the imprints left by her tumultuous past. The site where the Berlin Wall stood even two decades ago is a great attraction for the tourists. If one wants to see Oktoberfest, he or she must visit the German city of Munich between mid September and early October. It is a world famous celebration of Bavarian beer to which Munich is the home. The festival features beer tents, music and parades. Real German cuisine is on offer at this 200 year old festival visited every year by about 6 million tourists. If one wants to get lost in seclusion away from the madding crowd, there is no place better than the pined woodlands of the Black Forest situated in southwestern Germany. The densely grown pine and fir trees here cast dark shadows and hence the name. This is where the cuckoo clocks were originally made and are still found. Facilities for camping, hiking and skiing are available here as also accommodations for tourists in the places around the Black Forest. The secluded and unspoiled beaches of the Frisian Islands with their magnificent views are a tempting escape for tourists tired of city bustles. Located along the coastline of Germany with the Netherlands and Denmark, the popular Frisian Islands like Sylt and Amrum are sparsely crowded but much sought after tourist destinations of Germany. Germany is often called the country of poets and thinkers. She has a rich history of literature, art and music. Who as a child has not read the world renowned fairy tales by the Grimm brothers Jacob and Wilhelm? A few among the Nobel laureates in literature are the German authors like Hermann Hesse and Gunter Grass. Greatest German poets and playwrights are Goethe, Schiller and Berthold Brecht. Western philosophy has been greatly influenced by German philosophers like Kant, Hegel, Marx, Engel and Nietzsche. The Communism theory was propounded by Marx and Engel. German culture has been greatly influenced by music. The country has produced the world’s greatest classical composers like Beethoven, Bach, Handel, Brahms, Wagner and Strauss. German musicians have earned fame even in modern pop and rock music. Tourists flock to large music festivals in Germany of which the Rock am Ring is one of the largest in the world. German cinema has been enriched by the filmmakers like Fassbinder, Wenders and Herzog in the sixties and seventies. The famous Berlin Film Festival features great cinemas from all across the world. Among the renowned painters and artists of Germany are Surrealist painter Max Ernst and neo-expressionist Georg Baselitz. The German architecture can be broadly classified into three styles- Gothic, Renaissance and Baroque. As far as religion is concerned, more than 60% of the people of Germany are Christians. The faith is almost equally divided between the Protestants and the Roman Catholics. The Jewish population in Germany is a minority of only a few thousands since the Holocaust. The present Pope Benedikt XVI is from Germany. Berlin and Hamburg showcases the most popular culture and lifestyles of modern Germany. The popular German cuisines are sausage, dessert and cake. Beer is the most favorite drink with the Germans along with white wine. Rye bread is also a favorite food. As for sports, apart from football (soccer) in which the Germans take maximum interest, other forms of popular games are tennis, shooting and hockey including ice hockey. Germany’s passion for sports is evident from the country’s excellent showings in the Olympic Games. Germany has many karst areas, mines and caves. Tourists can visit these caves and mines. One important karst area is the South German Escarpments where stair-like plateaus of horizontal sedimentary layers are seen. These sediments were deposited during the Mesozoic era. The longest caves of the country are to be found at Muschelkalk plateau located to the south of Main River. Numerous Jurassic age caves of limestone have been formed at Swabian Jura and Frankian. The northern Alps regions of Sauerland and Thuringia are also important karst areas of limestone. In the southern foothills of the mining areas of Harz is located the gypsum karst. Coal mining in Germany is now almost closed due to high cost of subsurface mining. Earlier coal was mined in Saarland and Ruhrgebiet. Other ores mined in Germany were geothermal deposits found in fissures and cracks. Notable ore mining areas are situated in the crystalline highlands of Harz, Schwarzwald, etc. Brocken, the highest peak of the low mountain range Harz is composed of granite formed due to lava intrusion. The Harz has many gypsum and limestone areas. The limestones belong to Devonian period and are used for making cement. The geology of Harz is diverse. There are Silurian slates, Triassic limestones, plutonite massif (Brocken), pillow lava, metamorphic rocks and different ore deposits. The “Mittelgebirge” or the rocky and hilly areas dot the central parts of Germany. The cities located here exist with the forests and fields. Of these hill ranges, the major tourist attractions are the Harz, the Black Forest, Bavarian Forest, Ore Mountains, etc. A little part of the Alps is located in the south of Germany. The highest peak of this part is called ‘Zugspitze’ and its beauty attracts the tourists. By traveling further south, a tourist can easily reach the neighboring countries of Austria and Switzerland. Lake Constance, the largest freshwater lake of Germany is located along the border of these two countries. The lake gets its water from the Rhine River. The soil around the lake is fertile and is Germany’s one of the important areas for growing fruit and wine. The oldest inhabitants of Germany were the Celts. Towards the end of the 2nd century BC, the Franks, one of the German tribes came to Germany. They gradually started to dominate Western Europe. From the 9th century AD onward, it was the German rulers who headed the Holy Roman Empire till the Empire declined during the early 19th century. The Reformation pioneered by Martin Luther in the 16th century changed the relations between the state and the church. Germany was broken into numerous small states by the Thirty Years’ War fought from 1618 to 1648 for the throne of Bohemia. Meanwhile in the 19th century Germany, struggle for power flared up between Prussia and Austria to take control of Germany. Bismarck led the Prussians to victory and unified Germany after overcoming Denmark, Austria and France in successive wars between 1864 and 1871. Bismarck founded a powerful and centralized Germany for the first time in the history of the country and the Prussian King Wilhelm I became the German Emperor. World War I saw the defeat of Germany and thwarting of the German people’s aspiration to become leaders of the world. It was at this moment of political and economic crisis that Adolf Hitler took over as Chancellor and started to inspire the people for a Greater Germany. In 1935 Germany under his leadership withdrew from the League of Nations. The country then started occupying Rhineland, Austria and Czechoslovakia in violation of all established treaties. Hitler’s invasion of Poland on the first day of September 1939 led to World War II. Hitler started genocide focusing on exterminating the Jews whom he held responsible for the decline of Germany. The War continued till Germany was defeated by the Allied forces in May, 1945. The Holocaust perpetrated by Hitler in the name of nationalsocialism resulted in the death of millions of Jews and has remained a blot on the country’s history. Germany was subsequently divided into East and West Germany showing alignment with the USSR and the USA respectively that continued till October 3, 1990 when Germany was reunified as a sovereign state. Germany after the 1990 Reunification became a federal representative democratic republic. The German Republic has 16 federal states which are empowered by the Basic Law to deal with legislatures independently with some laid down exceptions. Practically however the state legislature handles only the cultural, communal and police affairs. The state constitutions prescribe political systems for each individual state adhering to a certain extent the basic framework of the federal constitution. 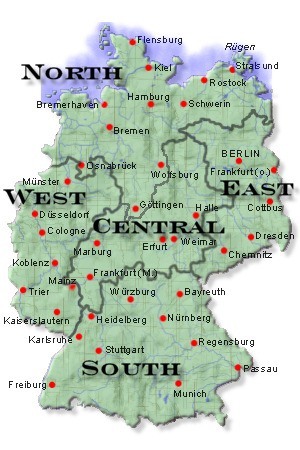 Berlin, Bremen and Hamburg are the three federal states (called city states) that are ruled by federal state governments. These state cabinets ruled by the Governor Mayor or the First Mayor (for Hamburg) are however smaller than the federal government. Elections for the parliaments of the 16 federal states are held every four or five years depending on what is prescribed in the state constitution. In Germany’s political system, the Federal Chancellor is the executive head of the federal cabinet or government and the parliament of Germany (Bundestag) elects the Chancellor and makes him or her responsible to it. The Federal President on the other hand is a ceremonial position with no executive power. The President is elected by the Federal Assembly specially formed for the purpose consisting of the Bundestag members and the same number of state delegates. Germany thus like the UK has a parliamentary system of government. The governments of the states are represented at the federal level by the Federal Council consisting of member delegates from the 16 states. The Federal Constitution of Germany lays down specifically laws relating to human rights and individual liberty and sharing of powers between federal and state levels as well as between the branches of legislature, executive and judiciary. The term of office of the Federal Chancellor of Germany is 4 years and the leader of the party with most seats in Bundestag is elected as the Federal Chancellor. Germany has mostly seen coalition governments of two or more parties. The vice-Chancellor is elected by the Chancellor usually from a smaller party of the coalition. Germany’s Parliament (Federal Diet) or Bundestag itself is elected for a term of 4 years. The cheapest way to get to Germany is by flying. The country offers for the tourist one of the best airline facilities in the world. For budget-minded travelers, there are flights between Germany and almost any European city. The budget flights are operated by Air Berlin, WizzAir, Europe Ryanair, Germanwings, etc. The important airports are Berlin, Frankfurt, Hamburg, Munich, Düsseldorf and Cologne. While Frankfurt is the most important and the busiest airport of the country, Lufthansa is Germany’s biggest airlines connecting almost all important cities of the world with Germany. Major airports of the country are connected to railways with InterCityExpress (ICE) being the largest rail network. A tourist can travel to the main rail stations of the major cities either by railway or other mode of public transport. Frankfurt airport offers the tourist the facility of luggage check in at Stuttgart or Cologne rail stations when flying from that airport. The tourist can reach the airport by ICE. For getting seats in budget flights, the tickets must be booked in advance to avoid disappointment. Tourist wanting to enjoy the breathtaking landscape of Germany must travel by train. EuroCity trains of Germany connect countries like Italy, Poland, Denmark, Switzerland, Austria and Czech Republic. The Rhine Valley lines are one of the most beautiful railroads in the world. The train travel however might be a little costlier than budget airfares. Discount cards are available for train travels and such discounts are higher when the journey originates and terminates within the country. The German motorway (Autobahn) is famous for outstanding roads and widespread network. Tourist cars do not have to pay any toll or fees. As for fuels, other than gasoline which is costly, the tourist car has the options of using diesel, LPG and already sometimes “Erdgas” which is compressed natural gas. All manned gas stations in Germany allow the facility of post-refuels payment. In German cities, car rentals are easily available and one way journey within the country does not attract any extra fees. German cars are generally using manual gearbox although a tourist if so desires can get automatic gearbox car. To support us in developing this site please suggest your description or any additional information of Germany to the operator. You are the one to put it in.